Contrary to popular belief, coil split and coil tap are not just two ways of saying the same thing. There’s quite a large difference in the way they function and the resulting sound. 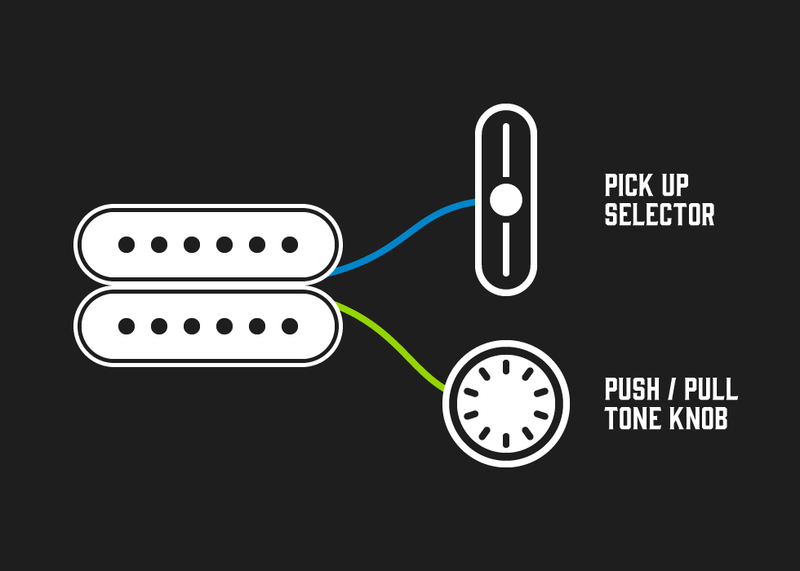 A lot of guitarists like to have the option of reducing the output from their guitar pickups in order to broaden the available sound palette. This is most prevalent when your guitar is equipped with hot humbuckers or high-output single coils and you’d like to reign them in on occasion. Modern music has more tonal crossover than ever before. It’s not as linear or simple as using single coils for ‘softer’ music genres and humbuckers for ‘heavier’ music. You could easily incorporate single coil or vintage pickups into metal and jazz or humbuckers into pop and folk with the number of effects you have on hand. So why not dabble in a bit of both? Unless you’re dead set on a particular type of sound, it’s worth having the choice of pickup tone. Variety is the spice of life, after all. Coil splitting only applies to humbucker pickups. Humbuckers use two coils and magnets of opposite polarity to cancel hum and produce higher output. To split a humbucker is to cut out one coil from the circuit, leaving the single coil to work its magic. Just like you’d hear from your run-of-the-mill Strat or Tele. Why would you want to split the coils of your pickup? Sometimes it’s just a bit of tonal relief from the thick, low-end nature of humbucker pickups. Single coils arguably have a richer character and dynamism in their tone, sitting in a more prominent position in the frequency spectrum than other types of pickups. They’re ideal for more nuanced playing or soulful leads. Similar to how coil splitting essentially ‘halves’ a pickup, coil tapping cancels out the full length of the magnet by taking the signal from a shorter point in the wire (usually around the midpoint). It can be utilised in humbucker or single coil pickups. The more windings a pickup has, the more output it produces. And by reducing the amount of wire the signal runs through you get a lower output as a result. This is great for recreating a vintage sound with a full range frequency and less midrange onus. It’s worth noting that a coil tapped humbucker won’t necessarily sound like a single coil pickup, unlike the splitting process. There’s a good chance it’ll sound more like removing a boost pedal than anything else. Coil tap is generally more of a niche feature and not quite as versatile as coil split. It’s also less frequently used by major companies. What’s Better, Coil Split or Coil Tap? Gibson tend to use coil tap the most out of the big brands. They equip a lot of their guitars with modern pickups, but also provide the option of classic sounds if you’re into that too. Coil splitting circuits are usually found on guitars with two humbuckers. This is simply to provide you with other sounds you’d find useful to mix up your tone. Check out Charvel and Schecter to get an idea. In reality, there isn’t one better than the other. Have a go on guitars with either circuit. Find out for yourself if you prefer the ability to attain vintage tone or switch between single coil and humbucker sounds on the go. If you enjoyed this read, check out our other Labs articles!